Dream of Puppy's tonight in our cozy new flannel from The Cat's Pajamas. 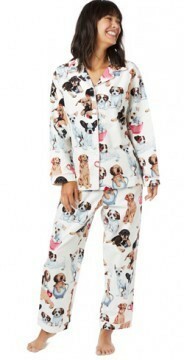 This pajama set has a roomy, comfortable fit. Most people find The Cat's Pajamas PJs to be larger than expected. This allows for a comfy fit and room for expected cotton sleepwear shrinkage, which is approximately 1″ in width and length.